On a moonlit evening on Thursday 13 March 1941, just after 9pm, the first of 236 German bombers converged on Clydeside. By 9.10pm, over the western suburbs of Glasgow, over Bowling and Dalnottar and – especially – over the crowded, densely housed and productive little town of Clydebank, the bombs had begun to fall. And the next night, it happened all over again. This was bombing of such ferocity that the explosions could be heard clearly at Bridge of Allan in Stirlingshire. The fires were of such frenzy that their glow could be clearly seen from rural Aberdeenshire and Northern Ireland. Clydebank was all but destroyed. According to the official statistics 528 people, from one geographically small community, were killed, 617 seriously injured. Hundreds – perhaps thousands – more were superficially hurt and cut, or traumatised by blast. Of some 12,000 dwellings – including tenement blocks as well as villas and semi-detached homes – only seven were left entirely undamaged. Four thousand homes were completely destroyed, 4,500 more so severely damaged as to be uninhabitable for months. The morning of the 14 March saw thousands of dazed survivors shambling along Dumbarton Road into Glasgow and, by the night of Saturday 15 March – as official records would eventually reveal – it was reckoned that more than 40,000 people had left the town amid utter chaos. And, in the days immediately following the German assault, soldiers and servicemen came home on leave to Clydebank wholly innocent of what had happened. John Bowman, in March 2011, bleakly recalled – for a BBC Scotland audience – returning from his distant base in Sussex to find not only his house obliterated, but most of the street; and that his mother, two brothers and a younger sister had been killed. 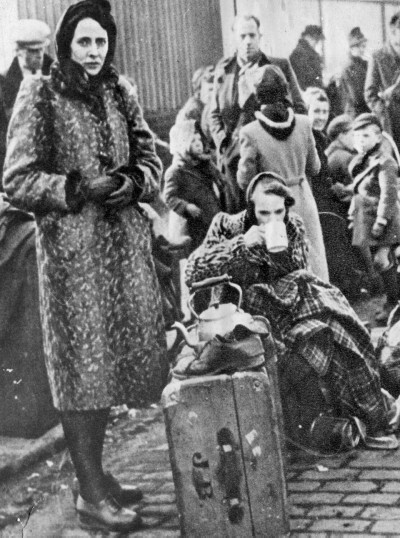 There is still a place called Clydebank, and many who survived March 1941 still live there. But thousands who fled never returned. The community that had retired for the evening of Thursday 13 March 1941 was smashed beyond recovery in a single night in what, in proportion of lives lost and homes destroyed, was the worst bombing raid anywhere in Britain in the entire war. Clydebank, the historian Angus Calder bleakly noted in 1969, “had the honour of suffering the most nearly universal damage of any British town”. But, outside Scotland, few have ever heard of the Clydebank Blitz. The Blitz, to most today, conjures up images of heroic London and battered Coventry – the first because it was, of course, the capital; and the second because the authorities deliberately exploited its ordeal for newsreel propaganda. Of course very many towns and cities were bombed. Those particularly hard-hit included Liverpool, Hull, Southampton and Belfast. Besides, Clydebank is readily confused with the vague term “Clydeside”, used to describe the greater Glasgow area. But – beyond that – there was calculated wartime censorship by what was laughably known as the Ministry of Information. 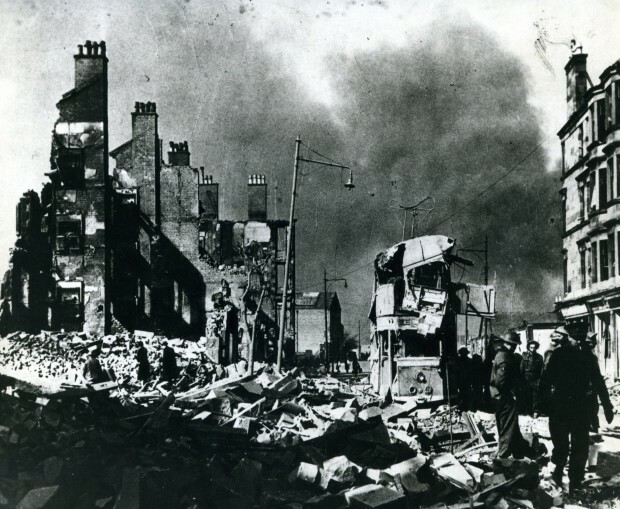 Officials refused to allow any mention of the town’s name in subsequent newspaper reports – which only speak of the bombing of “a town in western Scotland”. No film-crews were allowed into the ruins. Neither royalty nor Prime Minister Winston Churchill sped north to visit and console. And, when one survivor, Thomas Kearns, wrote a detailed letter to family in Belfast, it was intercepted (and held) by censors. His words would not see publication till 1971. A stark photograph, days later, of a Clydebank mass burial, was cropped before publication – on ministry orders – so that the public would not grasp just how terrible the disaster had been; sixty-seven people, or bits of them, lay in it. And the government did its best at first not to issue casualty figures at all and then to give most misleading ones. Bureaucrats seem to have been determined deliberately to conflate Clydebank and Glasgow fatalities, to the point where the home secretary was accused in the House of Commons of making “misleading statements”. Inevitably, feelings around Clydebank ran high. A high official warned Tom Johnston, secretary of state for Scotland, that locals heard such official statistics with “frank incredulity” and, a year on, there was great consternation in high places when a Sunday Post anniversary piece, on 15 March 1942, lamented the “1,200 Clydebank people” who had died “as the result of the savage two-night blitz on the town”. This article had somehow evaded censors. Clydebank Burgh Council now held a furious debate, in which all sides demanded hard, accurate numbers from the government. But these it refused to yield for the rest of the war. Thus, to this day, many regard the official death toll, as at last made known, with profound scepticism – especially when, years and even decades after the attack, human remains were still being found in Clydebank rubble. Hull, the worst-bombed city in England, likewise grew inured to being described as “an east-coast town”, even as sailors came home on leave and lamented through incessant raids that they felt safer at sea. Yet the suppression of detail on Clydebank’s ordeal was determined and exceptional. There were four evident reasons for this. The first was military. The Clyde generally was a vital workshop for ships, munitions and ordnance. Clydebank was of particular importance, notably for the great yard of John Brown’s. The authorities genuinely believed the Germans should never be told what they had actually hit, far less missed, lest they return and make good their failures. The second was mortification. Though the imminent attack had been known for hours by the authorities, no warning of any kind had been given the people until German aircraft were practically within earshot. RAF tactics for the defence of greater Glasgow on those nights – too complex to discuss here – had been a humiliating failure. The scant anti-aircraft guns by Clydebank had run out of ammunition. Scottish Office officials had treated the town so contemptuously that Clydebank could not bury her dead even in cardboard coffins; most finally deposited in that huge grave were in bed-sheets tied with string. 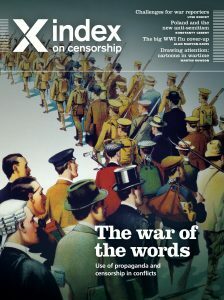 Through a range of in-depth reporting, interviews and illustrations, the spring 2014 issue of Index on Censorship magazine explores how modern propaganda was invented and looks at poster campaigns, partisan journalism in the USA, WWII, Iraq, Afghanistan and Syria. Join our mailing list (or follow us on Twitter or Facebook) and we’ll send you our weekly and monthly events newsletters and periodic updates about our projects defending free speech. We won’t share your personal information with anyone outside Index. A third undoubted concern was the spectre of Scottish nationalism. Tom Johnston had talked it up at every opportunity in the pursuit of London largesse, especially after a succession of witless mistakes. The BBC had ended all Scottish regional broadcasting when war began. The new BBC Home Service then persisted, for months, in the incessant playing of There’ll Always Be An England and authority at every level persisted stubbornly on using “English” as a synonym for British. In a spectacular gaffe – when a newsreel described the unambiguously Scottish RAF hero Donald Farquhar as an “English airman”, there was booing throughout Scottish cinemas. The final factor was a baseless fear of Marxist sedition. Clydeside was an early – and, by 1941, the most organised – fortress of British socialism. She had Independent Labour Party and communist councillors. During World War I, her womenfolk had waged a determined (and successful) rent-strike against rapacious landlords. David Kirkwood – by 1941, the town’s veteran MP – had, as an earnest and vocal pacifist, been locked up in Edinburgh castle during that conflict and, in 1919, unrest was such that the Coalition government even sent troops and tanks into the streets of Glasgow. On all these counts, then, officialdom toiled tirelessly to block, from wider national consciousness, the effective destruction of an entire community. It is only fair to remind ourselves – seven decades later, in a comfortable age – that Britain in March 1941 was battling for national survival – bombarded from the air, throttled in the Atlantic, close to starving and in real fear of invasion and conquest. The desperate desire to maintain morale, deny useful information to the foe and stamp on defeatism was by no means dishonourable. And the public information films and perky propaganda posters of the struggle are maddening today less for their bossiness than for their sexism. All the same, the fatuity of wartime censorship and propaganda – much of it to mask incompetence – is remarkable. Churchill himself intervened in two grave misjudgements. The first was in the wake of the Dunkirk disaster, when the Ministry of Information urged folk to report “defeatists” – having established it as an offence in law to spread “alarm and despondency”. Some 70 people were prosecuted after being shopped by ministry spies (cynically dubbed “Cooper’s Snoopers” after the minister of information, Duff Cooper) until Churchill ordered the nonsense to stop. Royalty was one matter; the people of Clydebank another. Whatever the motives and by whatever authority – perhaps even that of the prime minister himself – “official estimates of the damage and dead were deliberately played down”, as Meg Henderson, whose novel The Holy City is based on the experience of wartime Clydebank, put it in 1999. The town was never properly rebuilt; most of its March 1941 citizens never returned; and by the mid-1980s Clydebank had lost almost all her traditional industry. It’s a ragged, palpably sad place today, and with one lingering legacy from past ship-building glory – leading all Europe in asbestos-related illness and death. This article is taken from the spring 2014 issue of Index on Censorship Magazine. Get your copy of the issue by subscribing here or downloading the iPad app.